A quick dip in a cool, refreshing pool is the perfect way to beat the summer heat. Aboveground pools offer all the amenities of in-ground pools, including accessories such as slides and diving boards. Install a slide on your aboveground pool and splash the summer away in the comfort and safety of your own backyard. Water slides are fun for the entire family. Assemble the slide according to the directions. Each slide manufacturer has different assembly instructions, so read carefully to make sure the completed slide is structurally sound. Move the slide to the deck area near the pool. A deck is necessary when installing a slide for your aboveground pool, as the walls of the pool are not sturdy enough to support the weight of the slide. Point the bottom of the slide toward the center of the pool, with the edge of the slide extending approximately 36 inches over the side to prevent riders from crashing into the pool walls. Place the drill bit through the anchor holes on the bottom of the slide and drill a 2-inch-deep hole into the deck. Make sure the holes are as perpendicular to the wood as possible. Clean dust and wood fibers from the holes with a shop vacuum. Secure the slide to the deck with the hardware included with the slide. Tighten the bolts with a ratchet and socket. If the hardware includes wedge anchors, tap these into the holes to keep the bolts from shifting as you tighten them down. Hook a hose to the fitting on the underside of the flume and turn on the water. 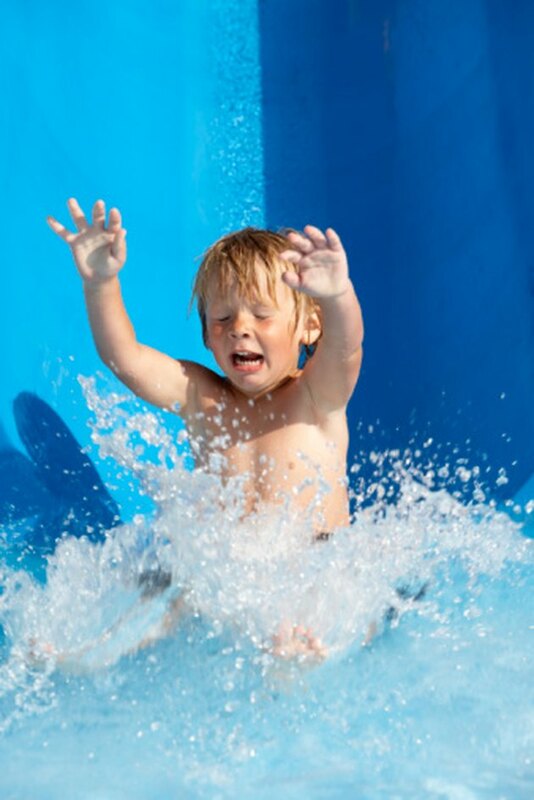 Let the water run to lubricate the length of the slide, then hop on for a test ride into your aboveground pool.